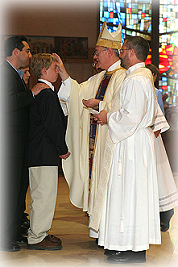 T he Sacrament of Confirmation is conferred annually on our young men and women in the 8th grade of our parish school and CCD. Confirmation of adults can be arranged by calling the parish office. We will assist you in arranging to be confirmed at the Cathedral, or at the Easter Vigil. Please bring your favorite salad or dessert to share. More details on our Current Events page! We are a Roman Catholic Community committed to extending the mission of Jesus Christ through word, sacrament and service to the people of the southwest corner of Youngstown and the surrounding areas. Copyright © Saint Christine Parish. All rights reserved.